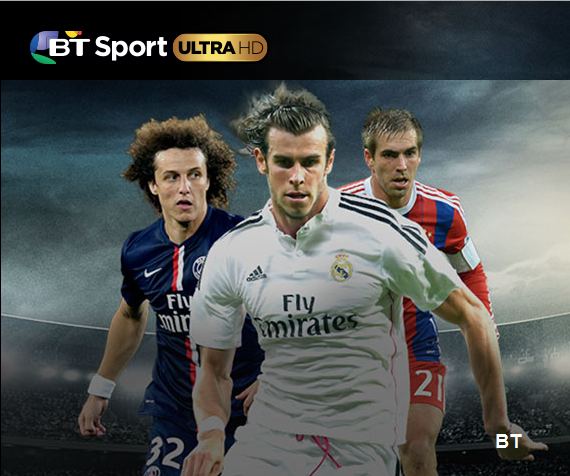 BT's new Ultra HD sports channel will be made available to viewers with BT Infinity and BT's YouView service. The Community Shield will be the first broadcast on the new channel, with other live events shown throughout the season, including selected games from the UEFA Champions League, Barclays Premier League, FA Cup and Aviva Premiership Rugby. The channel promises to offer a picture quality 4x that of HD. Viewers signing up for the new channel will receive a new 4K/UHD YouView box, which will allow up to 600 hours of recordings in standard definition or 250 hours of HD content, with 1TB of storage. Due to the high bandwidth requirements for the channel, the service will only be delivered to BT Infinity users. Viewers will need to have a 4K/UHD ready TV for the service. Full details about the new service, including pricing, are yet to be revealed. But viewers can register their interest with BT, via its website. With the move, BT achieves a headstart over Sky, which hasn't yet revealed its plans for Ultra HD/4K broadcasts. But the UK is slightly behind other European countries - UHD transmissions of last weekend's Champions League final were made available to some audiences in France and Germany. None of the information supplied by BT mentions Virgin Media. The current Tivo box can't handle 4k, so no. Will this be available to watch via an App on a UHD/4K Smart TV ? Sadly no, BT Sport Ultra HD is only available via the BT Ultra HD YouView box.